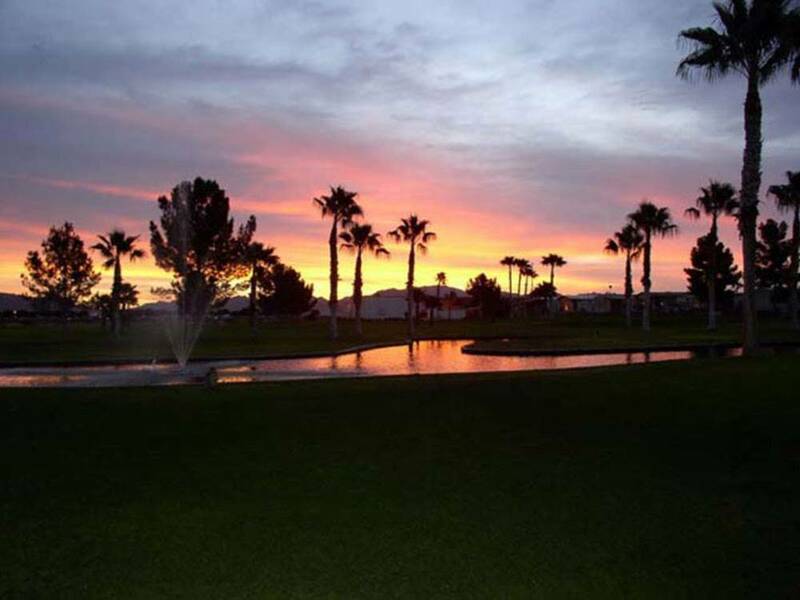 Our nine hole par 3 golf course meanders throughout our resort. This is a unique, executive course with well-manicured greens and lush landscaping. An ideal place to retire or vacation, with great mountain views. Almost none of the activities begin until November 1, including the golf. The spa was finally turned on to warm around the 22 Oct. This park was listed as dog friendly but it very definitely is not. You must walk your dog down the middle of the hot street. One very small corner with a huge hard to latch swinging gate is the only dog area. It is way too small for the number of dogs that use it. There are many gates around The park to take you outside. The goathead stickers are very bad in many of those areas making it hard. The special we used to visit was 30% off 4 nights. The way they do that is to give you one night free. That is 25% off, not 30% but that's how they do their math here. It really should be a lot less considering the lack of activities available. No one stated that the golf course or anything else is closed. It didn't state it on the website either. The people are friendly and I'm sure the park is fun in the winter just avoid the restaurant on Wednesdays, karaoke night. It's pretty awful, but the food is good. There are too many options in the area to come here if you are a pet owner. So we came down to Yuma to look for a vacation home in the hottest time of the year, 108 to 115 degree days, nuts we know. But we have to say that the park was empty except for a few local residents, and we had the entire resort to our selves. Best kept secret is to visit in the off season. We thought we had won the lottery, a private resort to our selves. Played golf, went swimming no one around us. The restaurant was great, the food was excellent. the staff although a few were a little cranky (because of the heat i guess), but most of all the staff very helpful. A wonderful vacation, and time at this resort we recommend coming down for a visit anytime. Close to a Walmart, and other locations. We really enjoyed our stay. 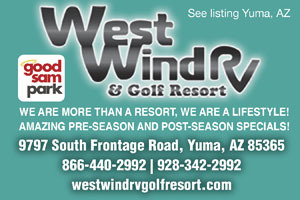 We stayed at Westwind on April 13th and April 15th, on our way to/from Tucson. There were two highlights for us: (1) the dog-friendly atmosphere and (2) the great food. We travel with our two dogs, and when I told the lady on the phone about them, she suggested a back-in space at the back of the park, near a gate leading to a very large sandy area where the dogs could run free. This was wonderful for our cattle dog, as she could chase her ball and get a good run, thus making her nice and relaxed for the rest of the trip. They also have a couple of small, fenced in grassy areas for dogs. Being at the back of the park made it very quiet - well away from the freeway. We didn't eat in the café/restaurant, but it's very scenic, overlooking the golf course I had a Philadelphia Cheese sandwich for dinner and a breakfast sandwich for breakfast and both were very generous servings and delicious. They were cutting back for the season when we were there, and on the 15th we got there after the office closed at 3:00 p.m., and the brochure we were given didn't include the gate code or the internet codes. Fortunately I had saved the brochure from the 13th. We don't use TV, internet, or restrooms but my husband considered having a shower until he saw the showers apparently he was less than impressed by them. The park was not crowded we had four or five spaces on both sides of us. In general we greatly enjoyed both stays, and will return. This was a great place. I loved the beautiful golf course and the cafe next to it where we could watch the golfers make their rounds. They have a lot of activities during the winter season. We were there at the tail end of the season so things were winding down, but we attended their last church service and it was wonderful. There were about 125-150 people there and the minister was inspiring. My friend, who is a quilter, met a lovely bunch of ladies who have a quilting group there, apparently year-round. The pool and hot tub are open all the time and that's convenient and user-friendly, too. I would stay there again anytime I pass through Yuma. I highly recommend it. It was a very pleasant stay. Everyone that worked there was nice and friendly. Not a lot of people there in the summer months. It felt like we had the place almost to ourselves. The pool and spa area was awesome. The hot-tub is 30' long and 4' deep. Truly amazing. We did not do many thing there during the days because its hot in the summer as everyone knows. The only con was the showers floors did not seem as clean as they could be. Maybe not as much maintenance during the summer months, Otherwise they would have gotten 5 stars for everything. We will be back!